Saturday 27th March, 1.55 p.m.
Metricon Stadium, Carrara, Gold Coast. Last Saturday, the inaugural AFLW season concluded with a Grand Final worthy of the name. Brisbane and Adelaide had emerged as clearly the best-performed sides in the competition, despite modest expectations of them prior to the season. Adelaide suffered narrow losses to Melbourne and to Brisbane, and edged Carlton but had won their other four matches decisively. 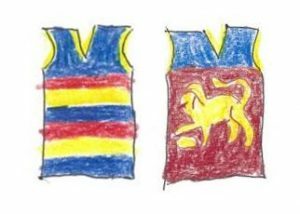 Brisbane enjoyed comfortable victories in all but two of their lead-up games, just narrowly winning the Grand Final preview – notably in Adelaide, at Norwood – and then being ambushed by a late Carlton surge which gave the Blues a barely-deserved draw. The competition had exceeded the expectations of almost everyone – the cynical as much as passionate observers together with those most directly involved, players, coaches and team officials, and those who had long crusaded for women’s football against the widespread apathy of the sport’s ruling bodies. One expects that social conditioning of girls makes them hesitant to display aggression. Football codes demand this more so than other sports. It was clear that women involved in this competition had reached the point where the ritualised and rules-bound physical combativeness provided a welcome acceptable outlet for them. My speculation is that the low scoring in most matches reflected the fact that it is easier to coach defensive skills than creativity. Throughout the competition, moments of (occasionally brilliant) individual initiative were the source of scoring, rather than the systematic approach more familiar in the top-level men’s game. This was no less true in the Grand Final. Wuetschner scored the only goal of the second quarter from a free, close in but on a tight angle in the left forward pocket. Meanwhile the Crows ran in six behinds which explored the full range, one rushed a couple of speculative long shots which bounced the wrong side of the posts, and one touched. Phillips, the dominant player for the Crows was imposing herself on the contest, while Heather Anderson was prominent in defence. Her distinctive pink head protector provided a homely touch as she was apparently wearing it so her mother could easily identifiy her on the field. Kaslar was outstanding in defence for the Lions with her marking particularly notable, while Wuetschner had scored the two goals to keep her team in touch, just six points adrift. Early in the 3rd quarter, Phillips goaled from a close-range snap after Varnhagen’s long shot just failed to make the distance. Behinds to Adelaide stretched their lead beyond two goals, three-quarter time approached, Phillips goaled from an opportunistic pick-up and snap, to restore the Crows’ advantage. At the last break, the margin was 12 points (1 goal six to be precise). The final quarter saw Brisbane mount a serious challenge, while Adelaide managed to hold on. Ashmore was instrumental in the key moments. Firstly with a free from the left forward pocket boundary she scored a behind; a moment later she marked the kick-in and delivered a superb pass to Tayla Harris who marked and scored the only goal of the quarter from 15 metres directly in front. As this brought the Lions within a goal for the first time since the second quarter, it led to a nail-biting final eight minutes. During this time the only score was Randall’s behind following her big mark. Her kick from 45 metres drifted right. Brisbane maintained their attack and the siren sounded with the ball in their forward 50, and some debate about a possible free for incorrect disposal went unpaid as the siren sounded to pronounce the Adelaide Crows as the inaugural premier in the AFLW. A straight-forward account of the game with a measured sense of the rhythm of the game. Like it. A succinct summary of the season to start your review gave this reader an appreciation of the importance of this game to the future of the competition. Liked that too. Thank you Peter, lovely report, succinct as Rick noted. Loved your thoughts at the beginning too, ‘a grand final worthy of the name’. The season was terrific and our writing rose to match the magnificence. Sorry I got to your report so late. Worth the wait.